Named for the Sandhill Cranes that make the farm their home each spring, Crane Dance Farm nestles among the rolling hills, woods, and wetlands of Middleville in Barry Country, Michigan ~ a perfect setting for a sustainable, regenerative, pasture-based farm. Providing chemical-free, nutritious, and delicious pork, beef, lamb, poultry, and eggs is our life goal, as we work humanely with our animals and in harmony with our land. Because we are committed to genetic diversity, we include endangered heirloom animals in our breeding stock and heirloom vegetables and grains whenever possible. Never do we apply toxic pesticides, herbicides, chemicals, or fertilizers to our land. On Crane Dance Farm, lush pasture, portable pens, fresh air, and sunshine nurture animals to thrive without the use of hormones, systemic biocides, or antibiotics. 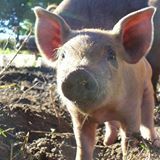 We believe that our farming philosophies and techniques (in stark contrast to the confinement life of factory farmed animals that are pumped full of chemicals and drugs to stay alive) are better for the earth, better for the animals, and, ultimately, better for the humans. The vast majority of our ruminants, pigs, and poultry are bred, birthed/hatched, and raised on the farm, assuring quality control from breeding through processing. We grind our own mineral-rich grains, most of which are grown by a certified organic farmer, and the remainder of which are purchased from local sources. We avoid supporting any aspect of the industrial agricultural complex which would chemically infuse, genetically modify, and inhumanely treat and house animals. "Thank you, Jill and Mary, for your hard work that is making a huge difference in the health of my family."